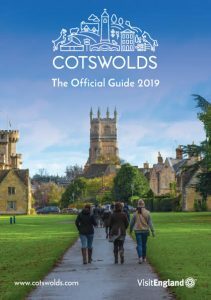 The new 2019 Cotswolds Visitor Guide is now available for visitors and locals with information to tempt potential holidaymakers to the Cotswolds this year. The Cotswolds Visitor Guide is a handy A5 size and will have a wide appeal both to people who think they know the Cotswolds and those who have never visited before. It is packed with suggestions including ideas for visits outside of the traditional summer season, as well as family fun, top ten romantic moments, gardens, shopping and eating out. There are also discount vouchers and a competition supported by the Lygon Arms in Broadway, Batsford Arboretum and the Gloucestershire-Warwickshire Steam Railway. Next → Next post: 7 February is ‘Harry Potter Book Night’ in Gloucestershire!